We get off the bus at a remote stop, with just a few shops clustered together in hopes of selling last-minute supplies. I look down a road that disappears into a blur of forest vegetation, and head in that direction. My wife Emma and I arrive before midday, because we know we’ll have to hike to reach Tayrona National Park. Our backpacks loaded with food supplies, a change of clothes, a tiny tent, and not much else, we disappear into 58 square miles of jungle. 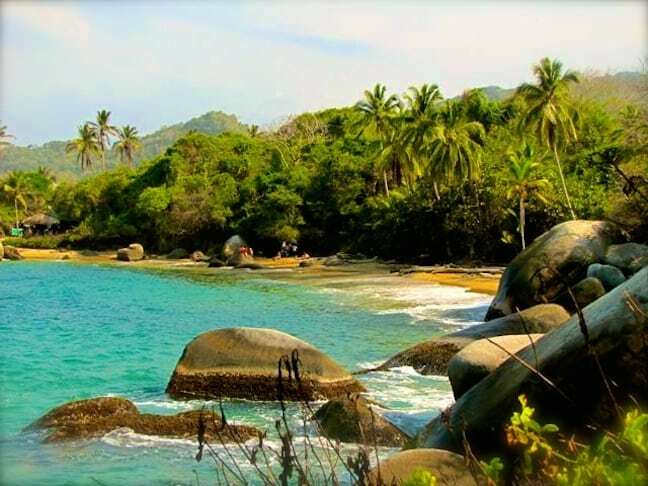 Known locally as Parque Nacional Tayrona, the park is situated along the Caribbean Sea in the northeastern corner of Colombia. It’s about an hour outside the city of Santa Marta, where drug cartels once held sway but now the tourism industry is a bustling business. Entering Tayrona park feels like taking a step FAR away from civilization, with modern buildings, transportation, and conveniences disappearing as you head further into the protected area. At the entrance, passenger vans pick up riders, drive them towards the coast, and drop them off where the road ends. 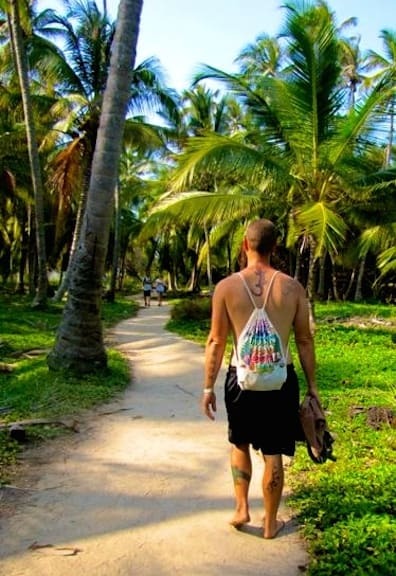 From there, it’s an hour-long walk to the nearest accommodations in Tayrona National Park– a choice between camping or, if you’re better-funded than us, rustic cabins. Both my wife and I are giddy as we get out of the van. We’ve been surrounded by the hustle and bustle of cities— Cartagena and Santa Marta— for nearly two weeks now. While seeing the sights was great, we yearn to get back to nature. 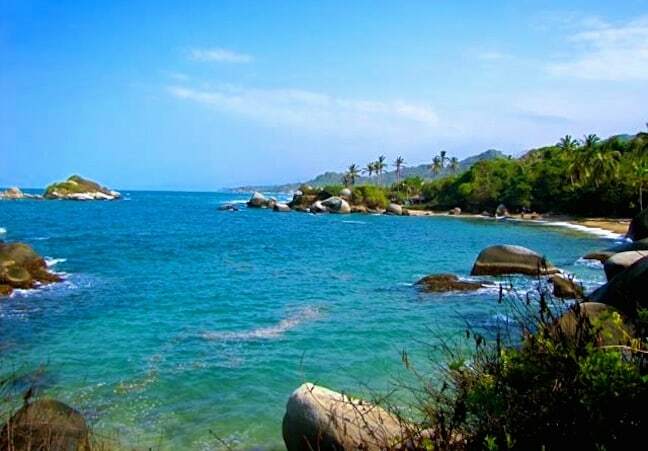 The nearest major city to Tayrona National Park is Santa Marta. It has an airport (Simón Bolivar International Airport) and is located about 20 miles from the park. Flights from anywhere in Colombia to Santa Marta should be very reasonable (around $100 USD) on Viva Air. Once you’re in Santa Marta, there are many possibilities for getting to Tayrona, including by boat, bus, organized tour, or rental car. Obviously, organized tours are the easiest option. A tour guide will handle all the little details of entering and exploring the national park, and providing background on the park’s history. An established tour is probably best for those with only a day to devote to the park. 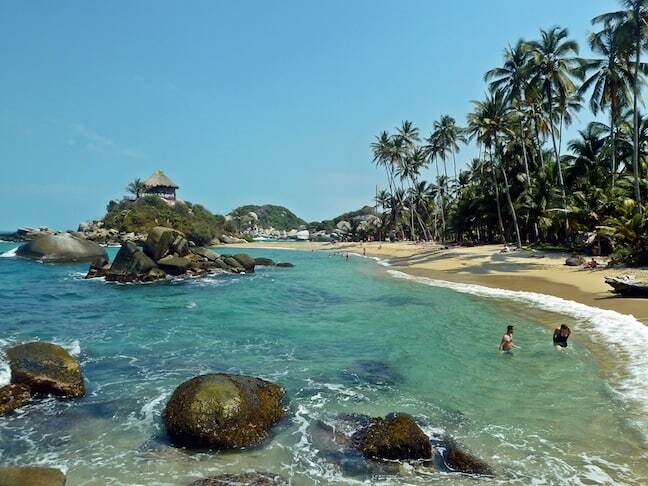 But for nature lovers and diehard beach lovers, Tayrona will demand more time. This remote slice of paradise is too beautiful to sum up in a busy 10-hour day, begging visitors to linger. For those wanting to stay for a night (or four), taking a shuttle to the park works best. Boat transport is a great adventure, but requires transportation-hopping and strict timing. They offer departures just once in the morning and return just once in the evening. Any Santa Marta hotel can arrange a shuttle that will pick travelers up, take them (and their luggage) to the park, and drop them off at the head of the trail for less than $10 USD. Those same shuttles will shuffle visitors back to town every day as well. While driving a rental car to Tayrona National Park is possible, the routes might involve tolls. And it’s easy enough to get there without dealing with driving in an unfamiliar country. That being said, the route isn’t all that difficult. Official parking is available in four spots around the park, and there are locally run lots nearby as well. So, as long as it isn’t a very busy time (such as a holiday), finding a parking space shouldn’t be an issue. To get to Tayrona National Park from Cartagena takes about six or seven hours and can be done via bus. For those who aren’t pressed for time, it’s probably worth spending a night in Santa Marta and getting to the park early the next day, rested and ready. Remember: Visiting Tayrona’s coolest sites is going to require some hiking right off the bat. 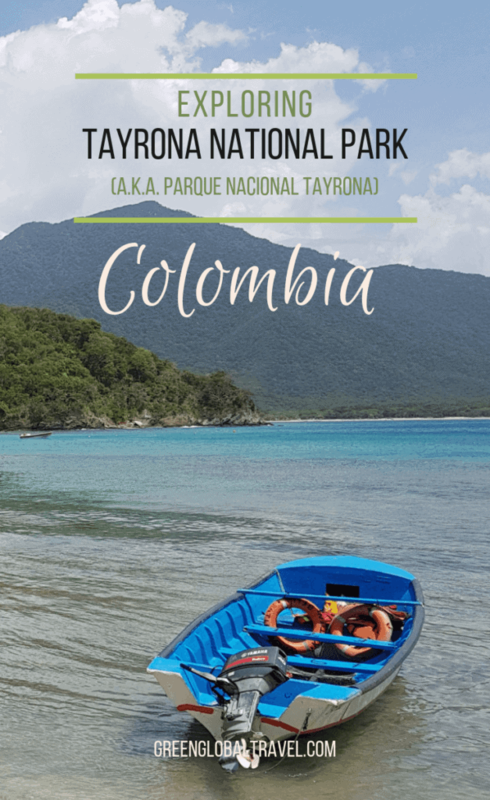 Admission to “Parque Tayrona” is a fairly simple process, but there are definitely some requirements you’ll need to be aware of. For instance, even if you’re just visiting Tayrona on a day trip, you’ll need your passport, which must be shown to officials at the gate before entering. Don’t make the mistake of leaving your passport in the safe at your hotel, as you will be denied entry to the park. There’s also a fee for entering the park, but most Tayrona National Park tours usually include this in the price. If you’re visiting on your own, tickets cost around 35,000 Colombian pesos (roughly $20 US), and they’re valid for your entire stay. For budget travelers like us, that’s all the more reason to stay longer! The shuttle that takes visitors to the trailhead are also included in organized tours. For those that self-drive or bus in, as we did, the cost is a dollar. It’s well worth it: The walk from the entrance to the trail takes about an hour, and isn’t nearly as noteworthy. For those staying in Tayrona, carrying your bags for this extra hour would be nutty. With that in mind, it’s important to keep your bag weight at a minimum. You’ll probably want the usual beach essentials– a flashlight, swimsuit, a long sleeve something, a camera, and whatever sun/bug stuff you require. A good pair of hiking shoes is also a good idea. Water is available in the park, so there’s no need to go overboard. Alcohol cannot be brought in (and security will check your bags), but can be purchased inside the park. Campers who prepare their own meals will need to carry whatever food they’ll want. Unfortunately, there is not much in the way of cell or Internet service available in the park. There is one spot—the restaurant on Cañaveral Beach— where you can get a signal. But why not embrace the remote beauty of the area and avoid technology for a few days? Almost immediately upon entering the park, we find ourselves on a hiking trail through the dense jungle. Our hike has us meandering along dirt pathways intermingled with wooden platforms and steps. Trails climb and wind through dense plant life replete with chattering birdcalls, brightly colored feathers, and the distant roar of the ocean. We lather up a sweat in no time, happy to be clambering atop rocks and walking amongst the trees once again. Though we feel utterly alone in this unspoiled ecosystem, we’re hardly the first people to walk these trails. Established in 1864, Tayrona National Park has been housing natural and archaeological treasures and preserving indigenous culture for 150 years. The Tayrona tribe, who created “The Lost City” of Ciudad Perdida, has inhabited the area around Colombia’s Sierra Nevada mountains for over 2000 years. Even now, it’s possible (after a considerable hike) to visit Pueblito, a village inside Tayrona park. After half an hour of hiking, glimpses of the brilliant blue Caribbean Sea flash beyond the foliage. Finally, we crest onto a lookout point that sweeps down to the shoreline. The sea is dotted with smooth, mossy boulders. The blue spans the horizon, with no boats in sight. Yet somehow, despite a line of hikers headed towards the same handful of accommodation options, we find ourselves utterly alone on a tropical beach in Caribbean Colombia. 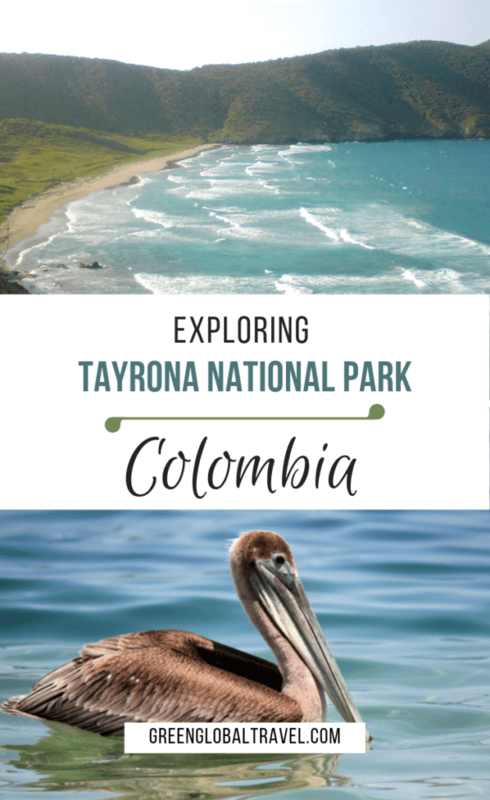 Tayrona Park is special for a wide array of reasons. In this relatively small protected area, you’ll find massive ecological diversity, including arid brush forests, muggy tropical rainforests, and elevated cloud forests. As you move through the woods, wildlife seems to be everywhere around you. 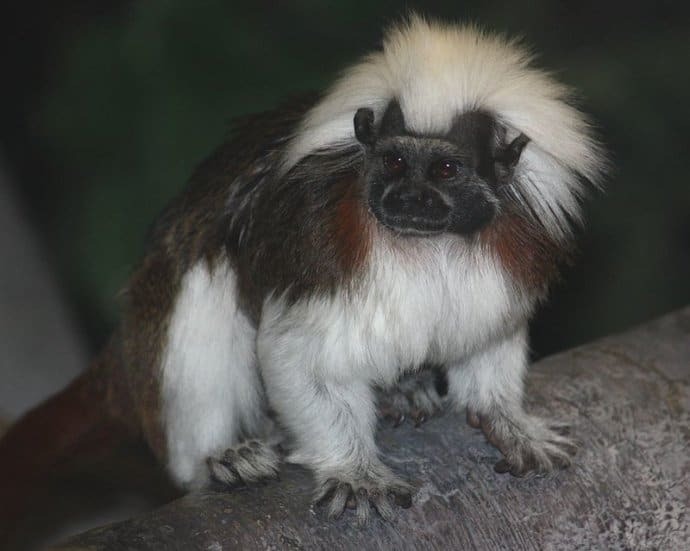 The park is home to several species of monkeys, including the common howler and capuchin and the critically endangered Cotton-Top Tamarin. There are also around 400 different species of birds, puma, deer, 30+ species of reptiles, and countless other intriguing animals. But the reason most people visit this remote area is to see the stunning beaches of Tayrona National Park. The soft sand upon which we’re walking tells us we’re getting close, but there’s only the occasional signpost to let us know that there’s ultimately somewhere to get to. We stay on the beach for 20 minutes without seeing another soul. The only sound is the cerulean blue waves lapping against the sand as I wipe the sweat from my brow. From there, the sandy path leads us through thickets of jungle, with brambles, brush, and low canopy trees on one side and a high rise of forest on the other. The sea disappears except for the metronome of waves and a rush of wind through the dense greenery around us. Animals scramble as we pass– a scattering of birds and the odd agouti or Jesus lizard. The beauty of Tayrona National Park’s beaches are the stuff of legend for travelers and locals alike. Having spent time there myself, I can assure you that these sandy swaths warrant the adulation. Occupying a huge stretch of Caribbean coastline, the beaches are secluded, serene, pristine, and perfect for a swim or a romantic stroll. You’ll find them all along the coastal trail. Cabo San Juan is the park’s most popular beach because it is open to swimming, has a stunning view, and is at the verge of a huge campground. La Piscina is another popular beach for swimming. There’s even a nudist beach! Walking along the beach from Cañaveral or Arrecifes to Cabo San Juan del Guía, you’ll find a marked hiking trail to the ancient ruins of Chairama. More commonly known as El Pueblito, these ruins of an ancient city were built by the same people as the famed Lost City. El Pueblito is smaller than that nearby attraction, and thankfully requires a less more daunting hike. After a bit of clambering over boulders here and there, fit hikers can reach this spot in under two hours. You’ll likely spot plenty of Tayrona’s animals along the way. Nearby, there’s also an existing settlement of indigenous Colombians who actually live in the park. PLEASE don’t take their picture, as it is strictly forbidden by their culture! The trail known as Nine Stones offers yet another excuse to enjoy the beautiful scenery of Tayrona National Park, get some great exercise, and check out Colombia’s ancient culture along the way. This beautiful trail tends to be less frequented than others you’ll find in the park, but it offers stunning scenic vistas. The cultural significance of it is the nine stones (piedras) found along its route. Each contains a perfectly round hole bored through it, through which ancient people studied the cosmos. These observation points could date back over 1000 years. This is another hike you can do in a couple of hours without getting in a hurry. Wildlife spotting in Tayrona is ridiculously easy. There are several species of monkeys that are found throughout the park, particularly howlers and capuchins. Reptiles and amphibians are pretty common as well. Iguanas are all over the place, yellow-striped poison frogs hang out near streams, and even caiman lurk in some of the park’s many freshwater lagoons. Agoutis– chunky little rodents that are like a smaller capybara– are everywhere. And the beautiful birds range from colorful toucans to brown pelicans. Dusk and dawn are the best times to spot most of these animals as they come out to feed. Scuba diving and snorkeling tours are also available in certain parts of Tayrona National Park. Scuba trips, equipment rentals, and even beginner diving courses are run out of nearby Taganga. The best dive sites in the park are around Granate and Isla Aguja. Snorkeling can be done wherever swimming is safe, with La Piscina being a decent location for spotting aquatic life. 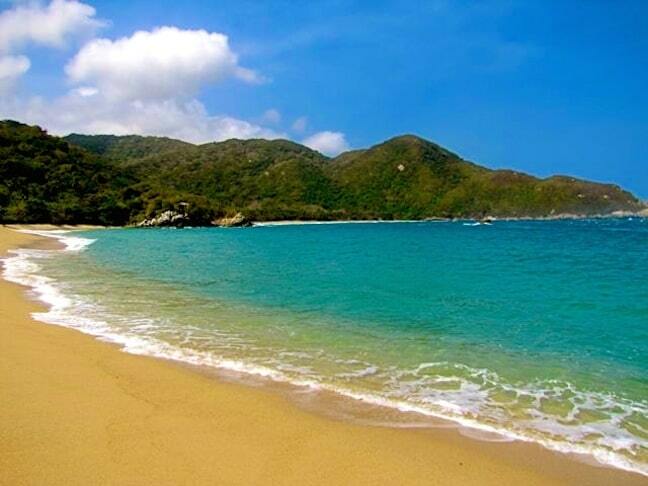 But Playa Cristal is known as the best beach for snorkeling, with clear waters, mild currents, and plenty of wildlife. There are Tayrona National Park accommodations available to suit just about any traveler’s taste, but all are of the eco-friendly variety. Since we’re traveling on a budget, we’ve reserved a site at Don Pedro Camping. There are other, more upscale (and expensive) glamping options available nearby, such as the posh cabins at Eco Hab Arrecifes. But quite a few people come here to camp. It’s no letdown. All of the campsites around us are full of coconut and banana trees, and the thick jungle around them remains largely untouched by human hands. We elect to nestle beneath the overhang of one of many citrus trees, including a grapefruit tree that still drops the occasional snack. We get our tent put up fairly quickly, stow our camping gear inside, and head out for another romp on those beautiful beaches. Once we’ve cleared the campsites, the walk there is on a phenomenal pathway winding through a coconut grove. In 20 minutes or so we’ve clambered over a sand dune, and we’re once again standing at the edge of the Caribbean Sea. Most visitors who stay in Tayrona National Park overnight elect to camp, primarily because that is the only widely available accommodation option. Camping there generally involves either renting/bringing a tent or renting/bringing a hammock. Obviously, prices are lower when you’ve got your own camping gear. The park’s campgrounds have really crude cooking facilities, and they often have overpriced canteens. Bahia Concha– This is the nearest spot to Santa Marta, just beyond Taganga. It’s cheaper, and the beach there is really nice. However, campers who stay here here must have their own gear, and it’s on the far side of the park from Tayrona’s main attractions. Arrecife– This area is less-visited for camping, but it’s actually closer to the park entrance and has cheaper, less crowded accommodation. This is partly because it’s still a walk to the beach, with La Piscina about 20 minutes away. There are two different campgrounds here, Don Pedro and Yuluka. Cabo San Juan- This is both the park’s most popular beach and, consequently, campground. This is where most campers go, despite the two-hour hike it takes to reach it. Also, this is where boats coming from Taganga drop you off. As a result, prices for camping here more than double. Playa Brava- This is the park’s most remote camping option, requiring a three-hour jaunt (and ascending a small mountain) to reach it. Most tourists won’t make this trip. But those looking to hang around a couple of days and get away from the tourist crowds might opt for here. The park’s other two camping areas are Cañaveral, which is along the Nine Stones hike, and Los Castilllettes. To be honest, neither of these sites are very good for beachgoers. They are located further from the beach, and the beaches they’re closest to are too dangerous for swimming. 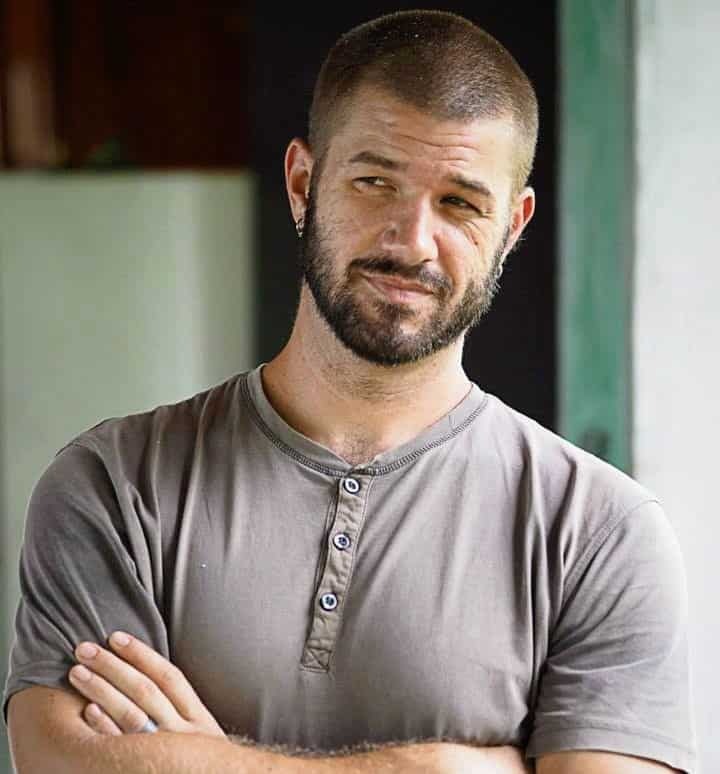 While the Tayrona doesn’t have much in the way of luxury accommodations, there are some handsomely priced “Ecohabs” for rent within the park boundaries. There are also a couple of very nice eco-lodges located between Tayrona and Santa Marta. If you want something fancier than that, you’ll probably want to stay in Santa Marta, which is about an hour away from the park. 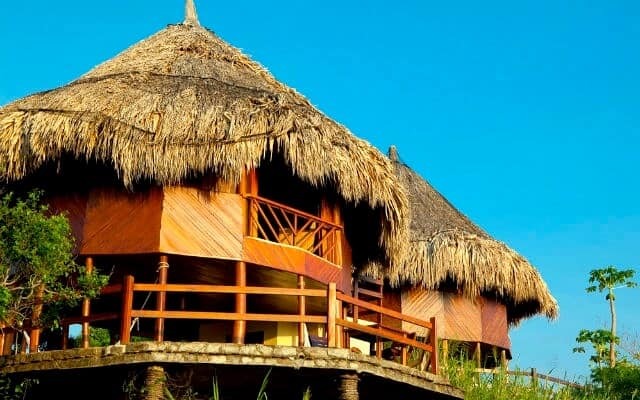 Ecohabs Tayrona– Located at Cañaveral beach within the Tayrona National Park boundaries, Ecohabs Tayrona is a collection of small thatch-roof bungalows. The cabins are built from local woods, inspired by ancient Tayrona (tribe) architecture. It also has a nice restaurant as well as a spa. Transport can be arranged from Santa Marta, Simon Bolivar International Airport, or Cartagena. Other Ecohabs Santa Marta Properties– Ecohabs offers several other options for staying near Tayrona National Park. For those in need of all the modern conveniences, the company has accommodation options in Taganga, Minca, and Los Naranjos. All are located right outside the park. Cabañas Arrecifes- The only other non-camping accommodation in Tayrona National Park, these six large, rustic cabins are located in the forested area of Arrecifes. All cabins have bathrooms, balconies with hammocks, and Direct TV. The site also has its own restaurant and hammock area, making it a great choice for families staying inside the park. 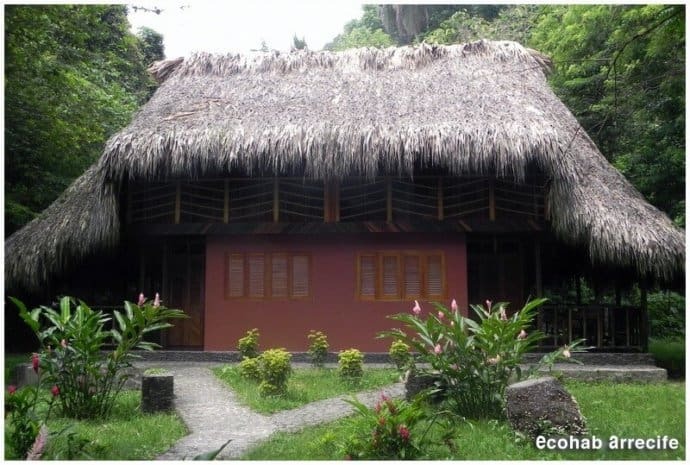 Quetzal Dorado Eco Lodge– This eco-lodge also offers ecohabs (the local name for eco-friendly accommodations). All rooms have free breakfast, WiFi, and pool access. There’s a spa there offering a view over the Piedra River, and an on-site restaurant that uses local, organic fruits and vegetables. Lush greenery and scenic vistas are everywhere, and the park is just a short ride away. 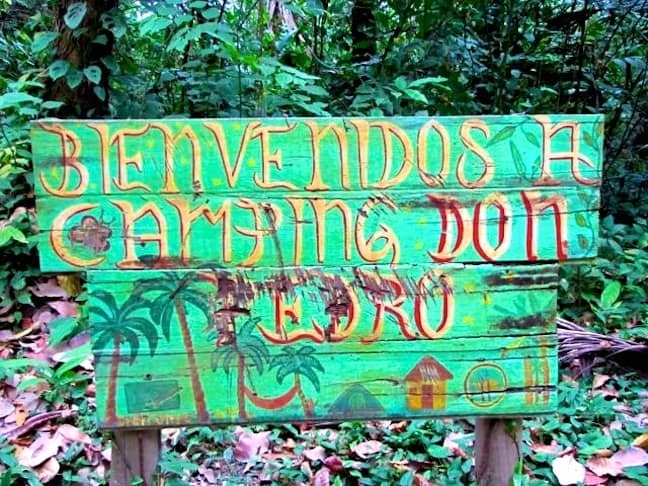 Playa Pikua Ecolodge– If you’re looking to explore the area around the park, this is a great base. Each eco lodge has a small kitchen, bathroom, fridge, and solar power. 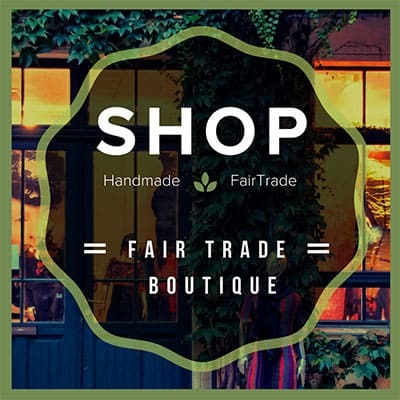 They’re constructed of responsibly sourced materials and put together by local artisans. All the nice hotel amenities are available here, but the place has a more natural, authentic feel than mass tourism-type resorts. The Caribbean Sea is renowned for its tranquil placidity. But Tayrona lies close to the Atlantic Ocean and, on many stretches, the surf crashes too forcefully for swimming safely. This is both a curse (because it’s hot) and a blessing, leaving large expanses of sand and sea vacant, without another soul in sight. We walk 15 minutes before reaching an inlet, La Piscina (“The Pool”), where a handful of swimmers have taken up temporary residence. There are a couple of wooden food carts here peddling snacks of arepas— thick flatbreads made of cornmeal and stuffed with goodies— and fresh fruits and juices. There’s plenty of room (approximately 95% of the beach) to spread out our sarongs and lounge. But with Colombia’s intense head and humidity, the lounging doesn’t last. Before long I’m bobbing up and down in the tide, happy for the cool crispness of the water. El Cabo San Juan Beach is the premiere spot for spending a day in Tayrona National Park. Its two bays are dissected by a sandy swath of land that leads to a rocky island topped with a beach-lover’s dream house. The water is clear and perfect for paddling around in. There’s plenty of space for sunning, but also a good amount of shade produced by the encroaching palm trees. We spend an entire morning there, swimming and then drying off in the sun before going in again. We explore the beaches further west, each one a little more deserted than the last. Ultimately, we picnic and nap for a couple of hours in utter isolation on a remote tropical beach. We aren’t even sure what the beach called, but we’re the only people there, so what difference does it make? Is there anything you can think of that beats that? On our way out of the park the next day, the cool air of dawn is still loitering. We retrace our steps from a few days earlier, this time finding an abundance of agoutis scampering across the fallen leaves. Every time we spot them, they’re gone again, and then another one appears in its place. Just as we’ve nearly cleared the jungle, we join a couple standing at the edge of the path, staring intently into the trees. 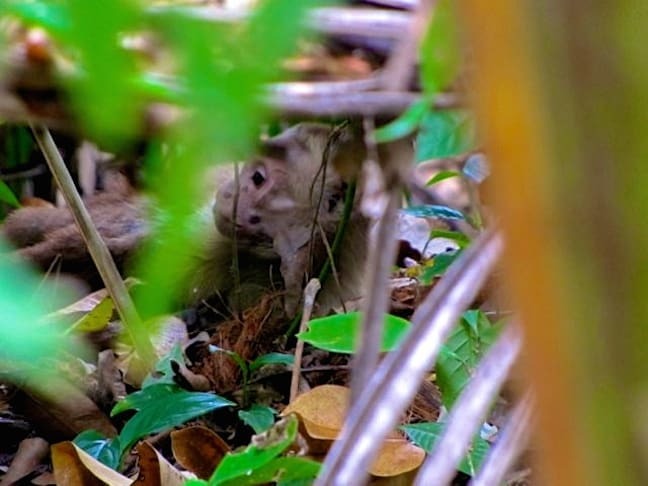 They point out a capuchin monkey hidden in the underbrush, not 10 meters away. Soon we spot them everywhere, the trees teeming with tails that lead up to curious faces looking over us. We linger there as long as we can, reluctant to leave Tayrona National Park behind. Nothing says you’re back in the city like the ricochet of car horns off concrete walls and metal posts, or the glistening of broken glass along the roadside reminding you that shoes are, indeed, a necessity here. And don’t those backpacks feel just a tad heavier as you sling them over your shoulder, looking for a hostel with cheap dorm beds? GGT Contributing Writer Jonathon Engels is a traveler, writer and teacher who has been living abroad as an expat since 2005. He has worked in nearly a dozen countries and visited many others in between. Jonathon is currently on a slow travel trip from Central America to Patagonia, volunteering his way throughout the journey. He is a regular contributor to One Green Planet as well as Permaculture News, two websites focused on helping to keep the world green and clean. He’s also the founder of The NGO List, a compilation of grassroots NGOs seeking international volunteers. More of his work can be found at Jonathon Engels: A Life Abroad, and his current whereabouts and goings-on are always available via his personal blog.